Marieke Gouda Cheese from Wisconsin for sale. Buy online at Zingerman's Mail Order. Gourmet Gifts. Food Gifts. American gouda to rival the Netherlands' best. A farmhouse raw cow's milk gouda (known as "boerenkaas" in Holland, the home of gouda) from Thorp, Wisconsin. Made by Marieke Penterman, this rivals the Netherlands' best cheeses in depth of flavor, complexity and balance. The current batches we're selling have been aged on pine planks since they were made in February. They have an irresistibly delicious balance of rich, dense, sweet and savory creaminess with those little crunchy flavor crystals we love so much. 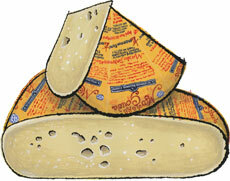 Marieke gouda has been a runaway favorite on our Deli's cheese counter. I'm pretty sure it'll be a hit in your home too. The wheels we're currently cutting into were made in June 2018. They've got a huge, sweet and tangy flavor and a beautifully creamy texture. The finish is very, very long. Outstanding.